Mwah-hahaha! 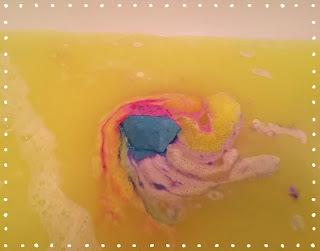 So today I bring you a rather sinister/naughty (whatever floats your boat) sounding title and a lovely bath bomb from Lush! 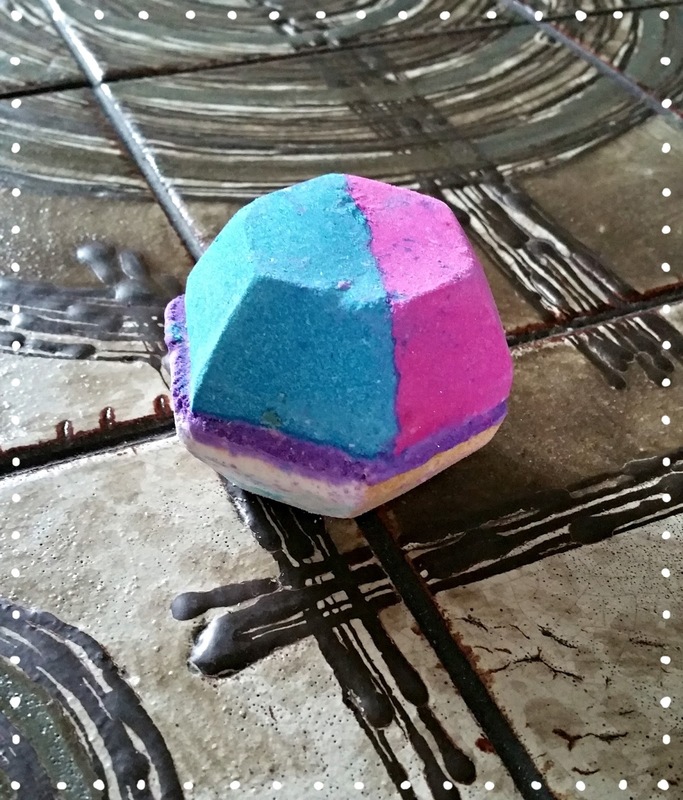 I present The Experimenter! 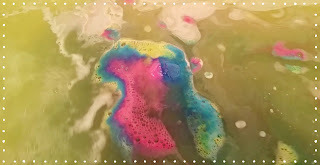 Gotta say, having seen this on the Lush website I thought the colour sections would have been less...blocky, but ah well. Look at all those colours! Pink, electric blue, white, yellow, and a purple macaroon-esque centre. I knew this was going to be special before I popped it in. The smell is wonderful; using Lush's now famous fair trade vanilla, and tonka extract you get a warming scent escaping from this brightly coloured beauty. And that scent gets better once it hits running water. The lady in Lush advised me to pop The Experimenter yellow/white side down in the bath and then start running the water to get the best show. I did as advised and what a fun thing it was to watch! Despite The Boy insisting that the yellow looked toxic it gave the best result to watch the rest of the colours explode across the water. This bath bomb contains not only masses of colour, but popping candy, and glitter to boot, so expect a cacophony of bath joy...until the blue gets going. But clean I did emerge! And soft too. And with only a smattering of glitter attached to The Boy and I. The formula is seriously moisturising; my skin felt amazing, baby soft and smooth. All in all a success! If you're in the mood for a bathroom show you can purchase The Experimenter here. At £3.95 it won't break your bank for something to brighten the end of your day; just be prepared for green! For best results, do as the Lush lady said, place white side down first and watch the party begin. How about you guys? Any colour bombs you can recommend? Or do all of them tend to end up a murky mess by the end?